If you were used as a tool for murder and then paid afterwards, what would you do next? A man wakes with no idea who he is and what he’s involved in. Thrust into a world of intrigue and mystery he must rely on his instincts to survive. 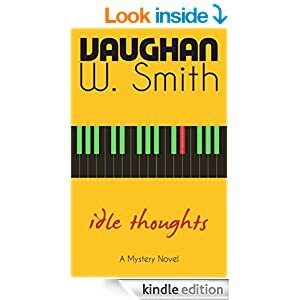 Idle Thoughts is a story of discovery. Follow along as the mysterious storyteller uncovers the secrets of his past, the events he is involved in and the rare artifacts that seem to be at the heart of it all. Can you solve the riddle of the artifacts and unlock the true meaning of Idle Thoughts? Found this book on Kindle Store free, saw no reviews after a few years of being published, felt sorry for the author and downloaded it. The book was like a roller coaster, ups and downs, long, slow parts and fast, quick passages. Based on Amnesia stories where the protagonist finds themselves in dangerous situations, they slowly discover pieces of themselves throughout the tangled web of the narrative. Not so with “Idle Thoughts”. What I thought was a promising storyline, quickly became splintered plots, new one-dimensional characters who only had one thought process that really added nothing to the plot. With each new hit, we are led to believe the protagonist with no name would discover clues about who he is, but no. He discovers a new trail of mysterious icons of unknown origin and age (although we are told ‘hundreds’ of years). No known provenance, age or history-only that they are important. And a worldly, rich and reclusive heartless man wants them. Because he doesn’t know what they do, either. So, through countless deaths courtesy of our amnesiac, he becomes involved in not wanting to discover his own identity, but these icons, that are also chased by a new character. She becomes a somewhat secondary protagonist of her own, thrown in as a ‘what the hell, here she is’ kind of way. Our amnesiac now is smitten with this unknown woman, who is also after these icons and the original protagonist’s boss, who he now is against. At this point, I wasn’t feeling quite so sorry for the author. I felt I was on a wild goose chase and wondered just where the story would end. And it didn’t. We are cut off from the end scene without explaining what the whole story was about, who the people are and what the whole point of the icons were. I felt cheated. Smith can write but at least in “Idle Thoughts” he can’t string a narrative together in a coherent theme. Books, novels-especially Mystery Novels should have a clear Beginning, middle and end. This was all middle. I give 1 1/2 stars.